Croke Park, Ireland’s biggest stadium and headquarters of the Gaelic Athletic Association (GAA), is a huge edifice. Though you might miss it – located next to the Royal Canal on Dublin's Northside, it is only glimpsed in parts, hidden away in a residential area. Yet this is hallowed ground for followers of Gaelic Games, and Irish history buffs. Though the stadium lies largely dormant on non-match days (except for the conference facilities), you may join a guided tour through Croke Park to take a peek behind the scenes of one of the largest stadiums in Europe. The massive Croke Park Stadium is easily accessible on foot from Dublin's inner city - and has been an integral part of the Irish capital since 1908 when Frank Dineen bought this plot of land to establish a venue for the Gaelic Athletic Association. Since then mainly Gaelic football and hurling matches have been played here, including most of the all-important All-Ireland Finals in September. It is the "Field of Dreams" for most young players and a treasure trove of memories. The complete rebuild of Croke Park started in 1993 and finished in 2002 when the first All-Ireland Final was played in the re-vamped arena. By the way, it is named after Bishop Croke, one of the most ardent supporters of the young GAA. Part of the history of the GAA was also part of the struggle for Irish independence – especially the tragic events of “Bloody Sunday”, November 21st, 1920. In a reprisal action for a number of assassinations, British troops interrupted the game Dublin versus Tipperary in Croke Park, opened fire indiscriminately, and killed 14 spectators and players. The scenes representing the events in the movie "Michael Collins" are not really historically accurate, however, for instance, no armored car was driven into Croke Park. Stadium tours, bookable on the Croke Park Website start regularly at the highly impressive "Wall of Clubs", where you will see the logos of all GAA member clubs sorted by province and county (native Irish in the visitor group are easily spotted, they immediately try to point out their local team). The normal route of the tour, which might be slightly changed due to operational demands on the day of your visit, then explores all areas of Croke Park within (roughly) an hour. Starting in the service tunnel, the cavernous area beneath the Cusack Stand with access to the changing rooms and emergency routes - big enough for buses, ambulances, service, and VIP vehicles. It also allows direct access to the playing field for bands, the Artane Boys' Band and the Garda Band being regulars. From the service tunnel, you'll enter the Team Lounge, where the winners of the day's match can enjoy a post-pitch pint (as can the losers, if they choose to do so). All furnishings and fittings of the Team Lounge where designed and made in Ireland. Most spectacular: A chandelier made from Waterford crystal that can be lit to shine in the winning team's colors. But before the pint, there is the (hard) game - next stop on the Croke Park Stadium Tour would be the changing rooms. Room 2 is rumored to be the "lucky room", as both the first users in the All-Ireland Finals of football and hurling went on to win. Most teams will want to use Room 2 ... except for Dublin, who prefer Room 1, to then do their warm-ups in front of the home crowd on Hill 16. Leaving the changing rooms through the players' tunnel is a unique experience with sound effects simulating the roar of the crowds. With a chill down your spine, you'll arrive at the stadium proper, right next to the pitch. During an All-Ireland Final, up to 82,300 pairs of eyes would be watching you now. During the tour you'll, however, be watching empty stands - Cusack (named after Michael Cusack, co-founder of the GAA), Davin (named after first GAA-President Maurice Davin), Hogan (named after Tipperary footballer Michael Hogan, shot on "Bloody Sunday" 1920), Nally (named after Patrick Nally, one of the men that inspired Cusack) and finally Dineen (see above), more often called simply “Hill 16”. Hill 16 is home to the Dublin fans, you'll see almost exclusively blue colors there. It is the only non-seated and non-covered stand in Croke Park, and it has a direct connection to the Easter Rising of 1916 - the rubble from buildings destroyed during the fighting was deposited here, forming a small hill. Hence "Hill 16". Afterwards, the tour will continue upwards and you will see the media area on the 7th level (should you suffer from vertigo, be extra careful here), the corporate boxes on the 6th level and the premium seats on the 5th level. Pricey places all of them. Additional attractions are Pre-Match Tours, adding the buzz of a match day to the normal tour, and a visit to the Etihad Skyline. The latter is literally a walk on the roof of Croke Park, giving you unrivaled views of the city. This and the Gravity Bar in the Guinness Storehouse are the best vantage points if you cannot fly. A lively and interesting museum is dedicated to the history of Gaelic Games, this is explored through exhibits, audiovisual displays, and hands-on experiences. All starts off with a medieval grave slab that actually shows a hurley (the “stick” used in hurling) alongside more conventional imagery. Being an ace hurler seems to have been an ever-popular way to make your mark. Nearby you'll also see how a hurley is actually made from a lump of wood, as the museum includes academic and practical information all through. Apart from the more “conventional” displays (like trophies, paraphernalia, and memorabilia), part of the GAA Museum's charm are the little “asides” concerning the games. Facts from the long history of the games are presented in an entertaining way – like who was a champion for the shortest time, who scored highest and lowest, which game could not be finished for lack of a spare football and so on. No ground-breaking records here, but lots of smiles on visitor's faces. The unavoidable main focus stays on football and hurling, but the other games are not forgotten either. So you'll find sections dedicated to camogie (an all-female variety of hurling), handball (which actually is more like squash without the rackets) and the Tailteann Games (Ireland's stab at creating a “Gaelic Olympiad”). Even some "non-Gaelic" games like rugby are thrown in. If you have young persons with you, they'll simply love the interactive part of the GAA Museum. Here you can explore the games hands-on. With modern technology, typical situations are recreated and offered as a challenge. Like trying to catch a high-flying ball with your hands in football (yes, perfectly legal) or “dribbling” with a hurley. Kids love it. Adults often leave embarrassed. Well worth a visit, a must for fans of the games – but maybe best combined with an actual match visit. 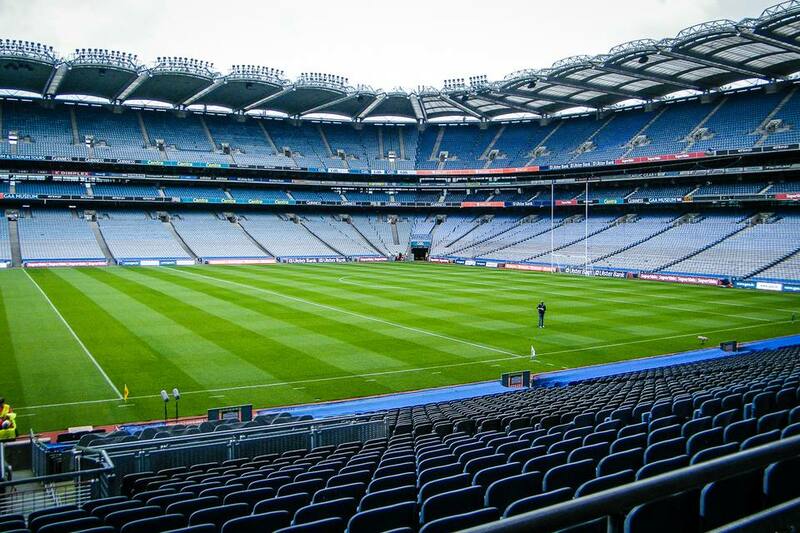 Croke Park on non-match days can be very uninspiring, the “buzz” is missing and you may at times feel very lonely. If you are interested in (Gaelic) sports, want to see one of Dublin's landmark buildings, maybe experience the Etihad Skyline – definitely go. The GAA Museum is also interesting, and Croke Park is not too far off the beaten track anyway. Location: Jones Rd, Drumcondra, Dublin 3. Public Transport: closest railway station is Drumcondra, a 5-minute walk. The closest DART stations are Connolly and Clontarf, a 15 and 20-minute walk respectively. Closest LUAS and Intercity stop is also Connolly Station. Dublin Bus routes 3, 11, 11a 16, 16a, and 41 from the City Centre to Drumcondra Road are convenient for Croke Park. Parking: free car parking is available in the Cusack Car Park, located off Clonliffe Road, accessed via St Joseph’s Avenue. Opening Times for GAA Museum: June to August Monday to Saturday 9.30 AM to 6 PM, all other months to 5 PM, Sundays and Holidays throughout the year 10.30 AM to 5 PM. For tour times and availability, and match day opening times of the museum, please check the Croke Park website (below). Admission Fees: stadium tours adults 13 €, children (3-12) 8.50 €, concessions available; GAA museum adults 6.50 €, children 4,50 € (included in stadium tour); Etihad Skyline extra charges, adult ticket 20 €. Estimated Time Needed: budget for one or two hours at least, depending on how interested you are. Food & Drink: a café is located next to the museum, on match days there also is a lot of catering throughout the stadium. Souvenir Shop: located next to the museum exit, with a good selection of topical and (some) general souvenirs. As is common in the travel industry, the writer was provided with a complimentary pre-match tour and match tickets for review purposes. While it has not influenced this review, About.com believes in full disclosure of all potential conflicts of interest. For more information, see our Ethics Policy.